If you're in need of a cold pasta salad recipe, this sweet and sour pasta is the perfect dish. The homemade dressing gives it a sweet simple flavor that your family won't be able to resist, and it's a great complement to just about any meal. The key to getting this done quick and effortless is pre-chopping your vegetables or using an electric chopper to cut way back on the prep time. Or, to make it virtually prep-free, save cooking the pasta, you can opt for pre-chopped,d ready to eat veggies from your grocer and just throw it all together when the pasta is done. I generally prefer to chop my own vegetables... this way you can guarantee you are getting the freshest produce and the best bang for your buck. Plus, you have a bit of time while the noodles are cooking to get the vegetables prepped and still have plenty left over to have this done in under 30 minutes. Once everything is chopped up, putting it together is a breeze, and you'll be pleasantly surprised how much flavor it has for such a quick, easy recipe. Of course cold pasta salad is a dish that is best served chilled, but it's not absolutely necessary to chill it if you need to get dinner on the table. I have served it on more than one occasion immediately after prepartion and it was still absolutely delicious. Chop your vegetables, and get them ready to add to the cooked pasta. Drain your noodles and rinse them with cold water, until cooled. 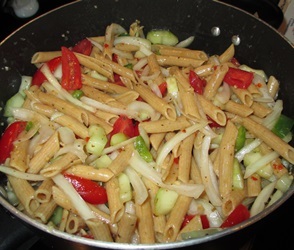 In a large serving bowl, mix pasta with green onions, tomato halves, cucumbers, green peppers and parsley. Set aside. In a medium saucepan, combine the sugar, rice wine vinegar, ground mustard, salt and garlic powder. Cook over medium-low heat for about 5-10 minutes, until the sugar is thoroughly dissolved. Pour over your cold pasta salad mixture and toss coat. Once coated thoroughly, cover and refrigerate it for about 2 hours to allow the entire dish to chill. Keep your tomatoes in a separate container and add just before serving to keep them from getting mushy from the dressing after it sits for a while. Serve with a slotted serving spoon to keep from loading too much of the dressing onto your plate. It is definitely sweet so a little bit goes a long way in this case. Allow the dressing to cool slightly and add a bit of ice cold water to the mixture before tossing it onto your pasta. This will not only cool down your dressing but it will help to thin it out, and the ice cold temperature makes the pasta more refreshing when served immediately after preparation.